The Headless Pyramid is an ancient Egyptian pyramid in Saqqara. It was most likely built by the Fifth Dynasty Pharaoh Menkauhor. 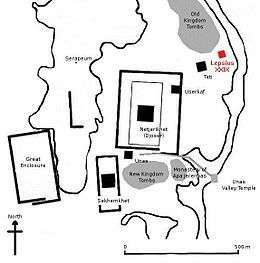 Map of Saqqara. In red, the Headless Pyramid (Lepsius XXIX). Karl Richard Lepsius, who visited Egypt in 1843 provided a first brief description and catalogued it as number XXIX (29) in his pyramid list. Gaston Maspero entered the underground chambers in 1881. A first, very brief, and unsystematic excavation of the ruins was made in 1930 by Cecil M. Firth. Then the ruins were once again covered with sand. In 1994, Jaromir Malek proposed that the Headless Pyramid should be the long-sought pyramid of Merikare (a pharaoh of the Tenth Dynasty) since it was known that this pyramid had to be somewhere in northern Saqqara near to the pyramid of Teti; the Headless Pyramid was a perfect candidate, also because there were no other pyramids of the Fifth Dynasty in its immediate vicinity. However, most scholars believed that the owner of the pyramid was Menkauhor instead, because the priests appointed for the funerary cult of this king were buried to a great extent in northern Saqqara. A systematic excavation of the substructure in 2008 under Zahi Hawass corroborated the assignment to the Fifth Dynasty on the basis of structure and materials that were typical of that era. Although no inscriptions with the name of a pharaoh were found, Hawass attributed it to Menkauhor because he is the only pharaoh of the Fifth Dynasty whose pyramid has not been identified. The pyramid had a length of approximately 52 m (171 ft) and was probably aligned with the pyramid of Teti. Virtually nothing is left of the superstructure, hence its name. On the north side lies the entrance to the underground chamber system, which was sealed by two granite portcullises. A broken sarcophagus lid was found in the burial chamber. ↑ Jaromir Malek, King Merykare and his Pyramid, in Hommages à Jean Leclant, Vol. 4. Varia (=Bibliothèque d'étude 106/4), 1994, pp. 203–214. Mark Lehner: The Complete Pyramids. Thames & Hudson, London 1997, p. 165, ISBN 0-500-05084-8.